On Monday July 18th the Balance Hair Spa team of beauty professionals were trained on the Peter Coppola keratin smoothing treatment. what makes this treatment different than others is that it doesn't contains harsh chemicals like aldehydes as preservatives. Aldehydes are commonly used in keratin treatments as a preservative. People with allergies or health concerns are instructed to stay clear of aldehydes for their toxic fumes when used with flat irons. Peter Coppola keratin smoothing treatments are the safest we can find on the market. The results are longer lasting while still remaining safe for both stylists and client to use. Ask your stylist about more information about this amazing treatment. Balance Hair Spa is pleased to announce the arrival of Illumina hair color by Wella. On Monday March 4th we were treated to an education on this new line of multidimensional color. Ask your stylist about this adavanced color service now offered at Balance Hair Spa. Comparing our color lines next to each other to see the difference. Trend Alert: Now Offering Feather Extensions! Get today's hottest fashion trend with our new, real Feather Extensions! Installation takes less than 10 minutes, and the feathers can last for months with no damage to your hair. Feather Extensions are suitable for all hair types — they can be washed, brushed, blow-dried, straightened and curled (low heat preferred). Treat these hair feather extensions just as you would your own hair. As hair grows out, our titanium flat micro-bead technique ensures an easy, simple removal and re-insertion of your bundle, without losing any feathers along the way. Our feather hair extensions are 100% reusable! 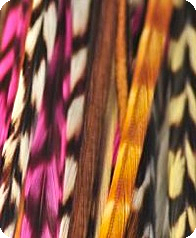 Each bundle comes with 6-7 gorgeous, high-quality feathers 10-14" in length, with a variety of color schemes to choose from. Price includes installation. A single, stunning Fat Feather 8-12" in length, with a variety of colors to choose from. Price includes installation. Schedule your appointment for Feather Extensions today! Call us at (484) 872-8457 or submit an online appointment request.